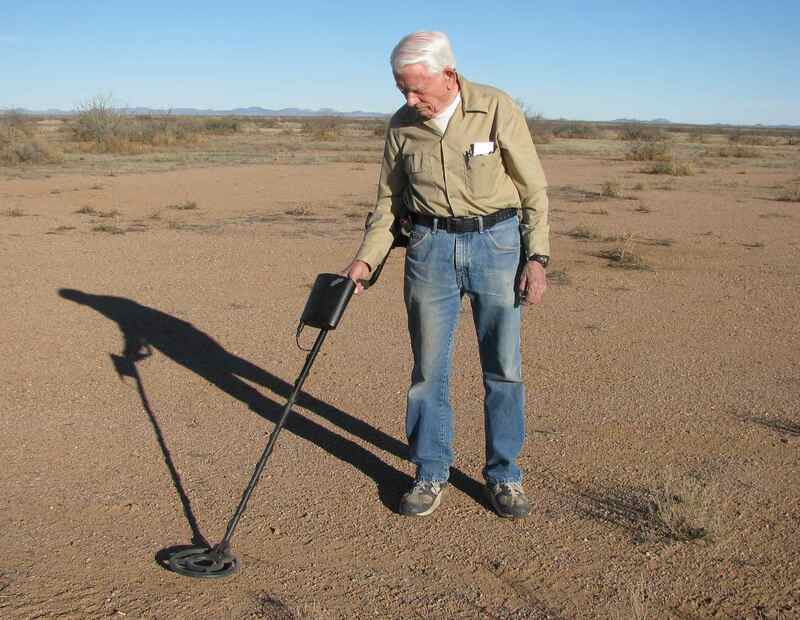 Survey Team Captain, Bill Madden, Starts New Year Survey Work at 1916 FAS Airfield. Bill’s commute is over 3 hours. The Centennial New Year of 2016 found our Airfield Site Survey Team Captain, Bill Madden, once again busily running his tedious (by hand) magnetic screening of the old 1916 Aerodrome for more century old Curtiss Jenny artifacts. Normally Bill makes the long, almost two-hour drive (just one way), from Las Cruces, NM, to set up shop at the FASF Airfield in Columbus with at least one or more of his Commission’s other members. But, yesterday, when one of his crew unexpectedly had to visit his physician, commitment bound Bill came along, anyway. Once again our enthusiastic Team Leader carefully and studiously worked his way around his designated search patterns in quest of more physical evidence of the First Aero Squadron’s presence, some hundred years earlier on that sage brush seasoned historic high desert patch of sand. Bill and Ric Lambart admired the fine condition of the FASF/COLAIR runway, which was again thanks to the friendly and courteous work of the local U.S. Customs and Border Patrol agents under command of Colonel LeBlanc of Deming. Not a weed to be seen anywhere on the 2,500 foot long smooth desert-surfaced runway! After long hours and some additional successful artifact discoveries, Bill and Ric rendezvoused at FASF Member, Ivonne Romero’s internationally famous PINK STORE for some delicious nourishment just a few miles to the South of the FAS Airfield in nearby Palomas, Mexico. This was Bill’s first visit to the well-known eatery establishment. After he had met Ivonne, and devoured his meal, he observed that the Store had quite an impressive and colorful collection of fine Mexican Art – – – and that his dinner had been truly fine Mexican cuisine! This entry was posted in HOT NEWS! on January 23, 2016 by FASFRIC. I’m looking forward to walking that field in March! Does anyone have any information about commemorative activities in Columbus, NM scheduled for March 9th, 2016? Yes. Things are shaping up at the last minute. The public events will be mostly on the 12th, a Saturday this coming March. The only things happening on the actual Centennial of the raid on the 9th, will be conducted by the Columbus Historical Society at their Depot Facility in Columbus. Again, many different activities are planned for the 12th, though, including the famous Cabalgata parade of horses meeting from way down in Mexico with the horses coming in from various placed in the states and gathering to rendezvous here in Columbus. We’ll soon be posting the schedule of events right here on the FASF website. Thanks for inquiry, David!